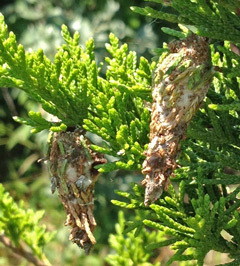 Two bagworm cases hang from a red cedar as their occupants feed. I can see them hanging all over our eastern red cedars right now greedily munching away on the tender young needles from the protection of their “bag”. Curious little devils but very destructive. Bagworms are not worms at all but the larvae of insects that attack many evergreen (and some deciduous) trees and shrubs. 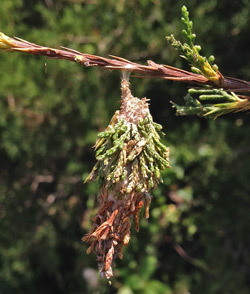 The caterpillars of the evergreen bagworm (Thyridopteryx ephemeraeformis) damage many landscape trees and shrubs by feeding on needles and leaves. A large infestation can lead to almost complete defoliation of trees. Some of the more common evergreen host plants include their favorites, arborvitae and red cedar, and also fir, hemlock, pine, and spruce. 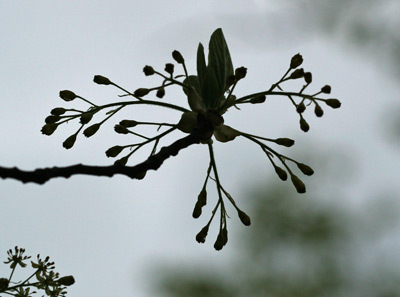 Deciduous host plants include black locust, honeylocust, sweetgum, and sycamore. 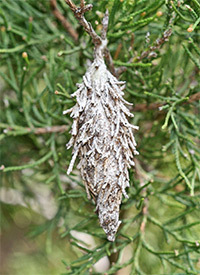 The name bagworm comes from the characteristic case or “bag” that these caterpillars construct around them as they feed. The bag is composed of silk and bits of plant material collected from whatever they happen to be feeding on. As the caterpillars grow in size over the summer, they enlarge the bag by adding more plant material to the front of the bag. It is like a “mobile home” during their larval stage and later becomes their pupa case. The life cycle of these insects is rather interesting. 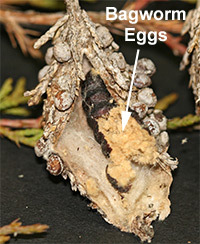 In late May and early June, the eggs hatch from bags that were constructed the previous season. As soon as they hatch, the young caterpillars crawl out and begin to construct a bag around their hind parts. They “wear” this bag as they move slowly through the branches feeding on needles and leaves. In August, the mature larvae attach their bags to a branch and enter the pupa stage looking very much like small pine cones. The pupa stage lasts about 4 weeks. The adult males, which are small moths with clear wings, emerge from the cases in September or October and begin to search for females. The adult females remain in their bag, releasing a pheromone to attract the males. Female bagworms mate, produce eggs, and then die without ever leaving the bag. In fact, the eggs develop within the dead body of the female. 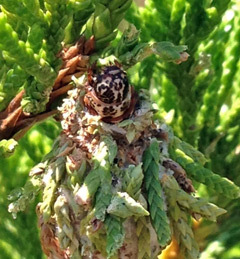 A female bagworm can produce up to 1,000 eggs which overwinter in the bags and hatch out the following May. Yikes, that’s a lot of little caterpillars! No wonder they can be so devastating to our evergreens. Birds and some insects will prey on bagworms but normally this predation is not enough to stave off an infestation. The following are some tips for getting rid of bagworms if you find them hanging from your trees or shrubs. As much as is feasible, try to physically remove and destroy as many of the bags as you can. The silk that holds the bags on the branches is quite strong and scissors or shears are usually needed to cut them off. Depending on the number of bags and the size of your trees or shrubs, removing them all may not be possible. We do not recommend using a ladder! The second most important step is to control the YOUNG caterpillars when they hatch out in the later part of May or June. Young caterpillars can be controlled (without harming beneficial insects) by spraying Bonide BT Thuricide (Bacillus thuringiensis). Bt is a type of bacteria infects and kills the young caterpillars. It is also helpful for controlling young tent caterpillars. If you miss the younger ones, larger caterpillars (and the young ones too) can be controlled using Bonide Captain Jack’s Deadbug Brew. This product contains spinosad, an insecticide derived from a naturally occurring bacterium. Like Bt, spinosad targets many different plant pests but spares most beneficial insects when used according to the label directions. Always read and follow the label directions when using any pesticide and NEVER spray any insecticide when trees or shrubs are in bloom! Ugh! The Beetles are Back! Ewwwww! What was that that hit me in the head? Unfortunately, I knew what it was before I reached up to get it out of my hair – a Japanese beetle! We have been lucky for the past two or three years – the Japanese beetles haven’t been bad at all. This year, they may be back in greater quantities. They must be starting to emerge now because, just yesterday, I had three separate encounters with these nasty beetles. in our morning glory leaves. In the morning I was enjoying coffee on our deck when I noticed a Japanese beetle on a leaf of our heavenly blue morning glories. Upon further inspection, I saw that there were holes in many of the leaves and a few big ones right next to this guy. Ugh! They’ve been feasting on the flowers! When I got to work, I had an e-mail waiting for me from someone whose 5-year old blueberry bushes were being attacked by Japanese beetles. They were wondering how to get rid of them because they were “beginning to do quite a bit of damage” to the plants. Then early in the afternoon, I was talking with a customer in the garden center and a Japanese beetle flew into my head and got stuck in my hair! Yuck! 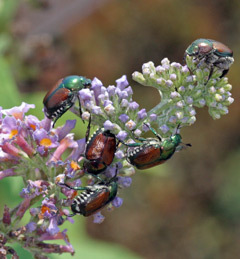 Japanese beetles are native to Japan – as their name implies. 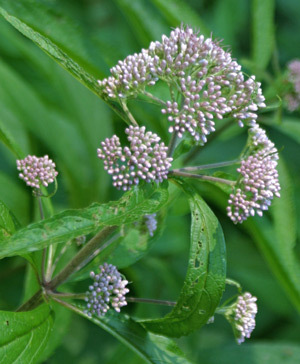 They were brought over to the U.S. accidentally (as is the case for many of our alien pests) in the early 1900’s and are now a major pest throughout most of the eastern United States and beyond. 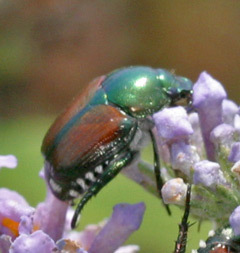 They are about a half inch long with iridescent copper wing covers and a shiny green thorax and head. Their legs have rough spines that get caught in everything – including your hair! Nasty! Japanese beetles feed on leaf tissue eventually leaving just the veins. 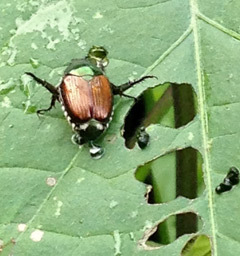 In our area of the Shenandoah Valley, adult Japanese beetles typically begin to emerge from the ground in early July. Almost immediately, they are up and flying around in search of food and mates. We are just starting to see them buzzing around the gardens. Once they mate, the females will begin to lay eggs in the grass. These eggs hatch about two weeks later and the young larvae (white grubs) burrow down and begin to feed on the roots of the grass. grass roots killing the grass. From late August through October, the grubs grow, molt, and continue to feed heavily on the grass roots. This is the time when you will begin to see damage to the turfgrass if you have a heavy infestation. Patches of grass start to turn brown and die. Because the roots are gone, these brown patches can be peeled back easily to reveal the grubs underneath. Once the weather turns colder in the fall and the soil begins to cool down, the grubs stop feeding and burrow down deeper into the ground where they spend the winter. In the spring when the soil warms a bit, the grubs begin to move up toward the surface and feed on the roots for a short time before they pupate near the surface. The adults emerge in early to mid summer and the cycle begins again. Japanese beetles have ruined this beautiful Echinacea flower. As you can see, these annoying beetles are destructive in two stages of their life cycle; the adults can ruin flowers, foliage, fruits, and vegetables with their feeding and the larvae/grubs can kill large patches of turf as they consume the roots of the grass. Hand picking is the safest method of control for beetles, however this is often difficult if not impossible to keep up with. If you carry around a small pail with soapy water, you can knock them off into the pail without ever touching them. Pheromone traps can be used but be sure to place these at the edge of your property and not in or close to your gardens as the attractant will bring the beetles in from all around the neighborhood! 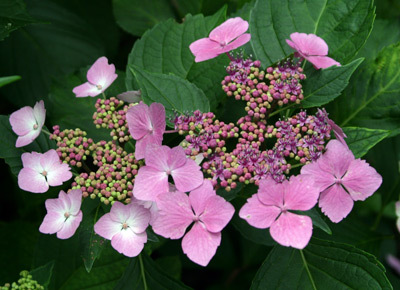 Control with an insecticide is tricky since Japanese beetles often attack plants that are blooming; eating the foliage or worse, the flowers that the bees and other pollinators frequent. 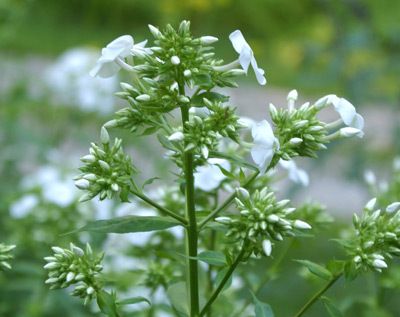 Bonide Captain Jack’s Deadbug Brew is listed for controlling Japanese beetles and many other pests in the vegetable garden as well as on ornamentals. This product contains spinosad, an insecticide derived from a naturally occurring bacterium. 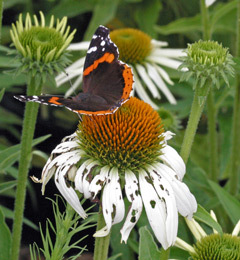 The nice thing about spinosad is that it targets many different plant pests but spares most beneficial insects when used according to the label directions. It is similar in this way to Bt but it lasts longer in the garden and targets a broader range of insect pests. 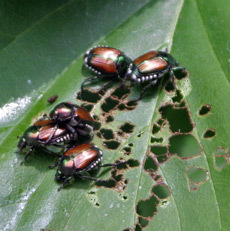 Bonide Eight is also listed for control of Japanese beetles as well as many other destructive beetles and garden pests. Like Captain Jack’s, it can be used in the vegetable garden as well as on fruit trees and ornamentals. Always use according to the label directions. A word of caution: Even natural or organic products can be deadly to pollinators like bees. 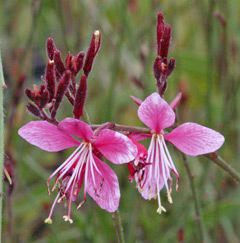 If possible DO NOT spray when plants are in bloom. If this is not possible, spray early in the morning or later in the evening when bees are less active and ALWAYS read and FOLLOW the label directions! Sometimes, for a plant like Buddleia that blooms all summer, Andre will shear off all the flowers before spraying an insecticide. Of course, controlling the larval stage will help prevent infestations of adult beetles to some extent. 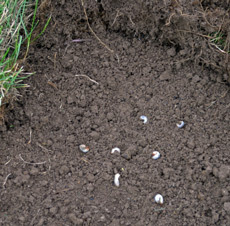 Here are some tips for controlling the beetle grubs in your lawn. For these guys, timing is everything! Hopefully the beetles won’t be too bad this year. We will definitely know soon! 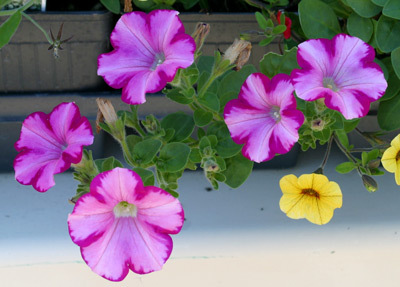 It’s Independence Day and the flowers are celebrating with us! Well – it might take a little imagination in some cases but there are lots of flowers that burst into bloom with an explosion of colorful petals reminiscent of our Fourth of July fireworks. Take for instance the colorful Delosperma cooperi (Ice Plant) shown at the top of the post. The beautiful magenta petals radiating from the sparkling white central button remind me of a brilliant display of exploding fireworks. Even some of the tree flowers get into the spirit – although they are a little ahead of the 4th of July celebration! 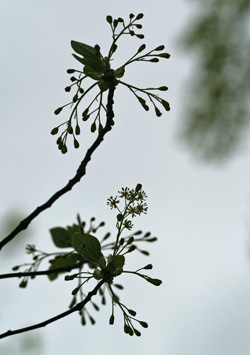 The interesting sassafras flowers produced in the spring are drooping racemes that resemble a beautiful aerial display. 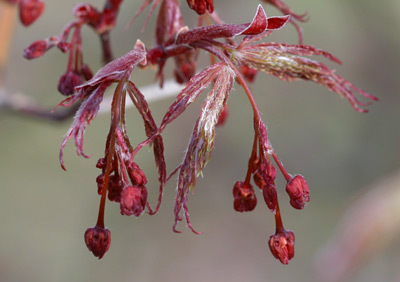 My little Japanese maple has pendulous flowers that remind me of falling missiles about to burst into a shower of sparks. 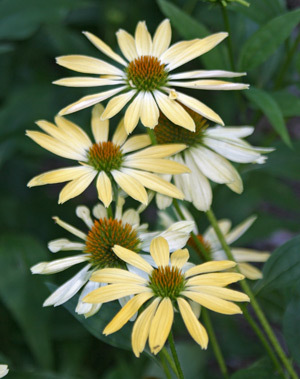 Composite flowers, like chrysanthemums and Echinacea, can often appear very much like fireworks exploding in the night sky. In fact, a glossary of firework effects contains terms like chrysanthemum, bouquet, dahlia, palm, peony, pistil, and willow to describe the aerial displays of different types of fireworks. It’s quite interesting! 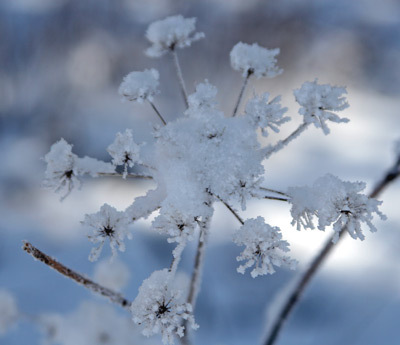 Even the “flower skeletons” of fall and winter can remind you of bursting firework explosions! 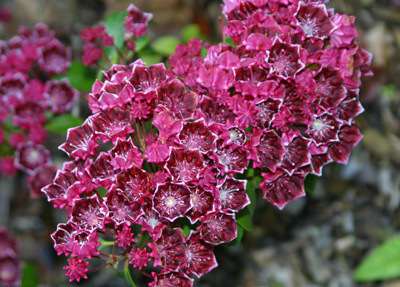 So many different flowers, flower clusters, and seed heads have interesting “explosive” shapes. Below are a few photos that I have taken over the years. These pictures were taken in the Viette gardens, in my gardens, and in my sister’s gardens. Like I said; you may have to use your imagination! I hope you enjoy the floral fireworks! 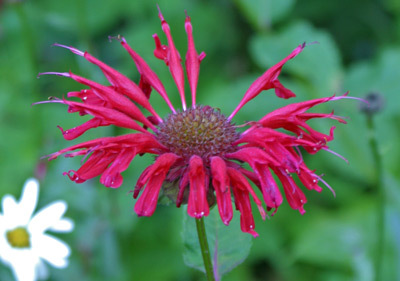 A bright red Monarda bursts into a shower of color! 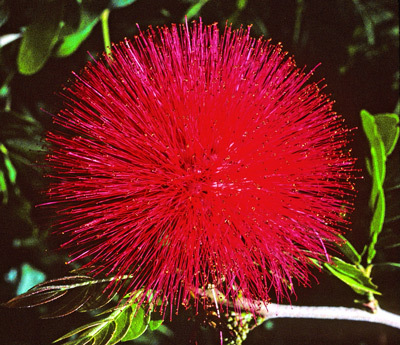 Flower of the powder puff tree (Calliandra haematocephala). From Andre’s slide collection; St. Thomas, U.S.V.I. 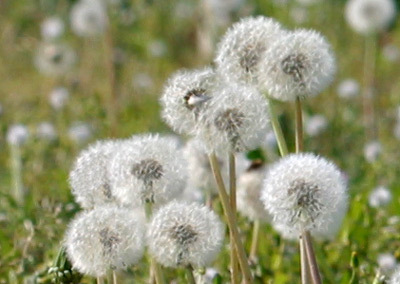 Dandelion seed heads remind me of a mass of exploding fireworks. 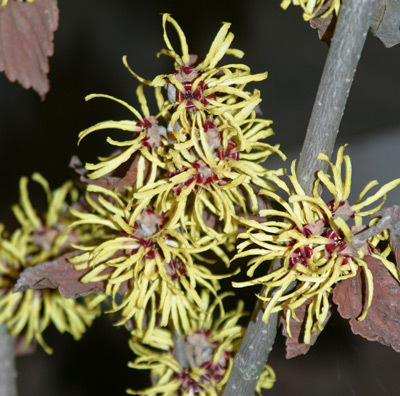 Flowers of witchhazel (Hamamelis) create a grand finale!